Bulmers Original Cider is a popular Apple Cider available from Tesco Groceries in 50cl to buy online. 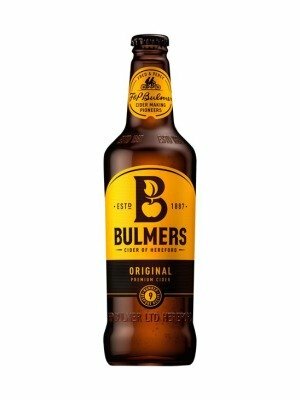 Visit Tesco Groceries for the best price for 50cl of Bulmers Original Cider or compare prices on our other Apple Cider products. Our Co-founder Fred, once cycled 500 miles in seven days in the pursuit of quality apples for Bulmers cider. This belief, that better apples make better cider, still holds true today. Bulmers original balances sweet and sharp apples, including Dabinett and Yarlington mill varieties, home-grown in our Herefordshire orchards, to produce this great tasting medium-sweet cider. Where to buy Bulmers Original Cider ? Bulmers Original Cider Supermarkets & Stockists. You can buy Bulmers Original Cider online in most retailers and find it in the Apple Cider aisle in supermarkets but we found the best deals online for Bulmers Original Cider in Tesco Groceries, and others. Compare the current price of Bulmers Original Cider in 50cl size in the table of offers below. Simply click on the button to order Bulmers Original Cider online now.